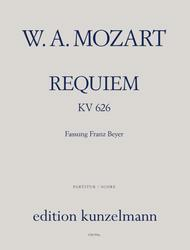 Requiem in d minor K626 composed by Wolfgang Amadeus Mozart (1756-1791). Edited by Franz Beyer. For SATB soli, SATB, 0022 0230, timpani, strings (organ). This edition: Urtext. Choral. Full score. Published by Edition Kunzelmann (PE.GM0990P-S).Full score (9" x 12").